This is a World versus World Bingo. You have May 18th - June 21st to complete a Bingo. 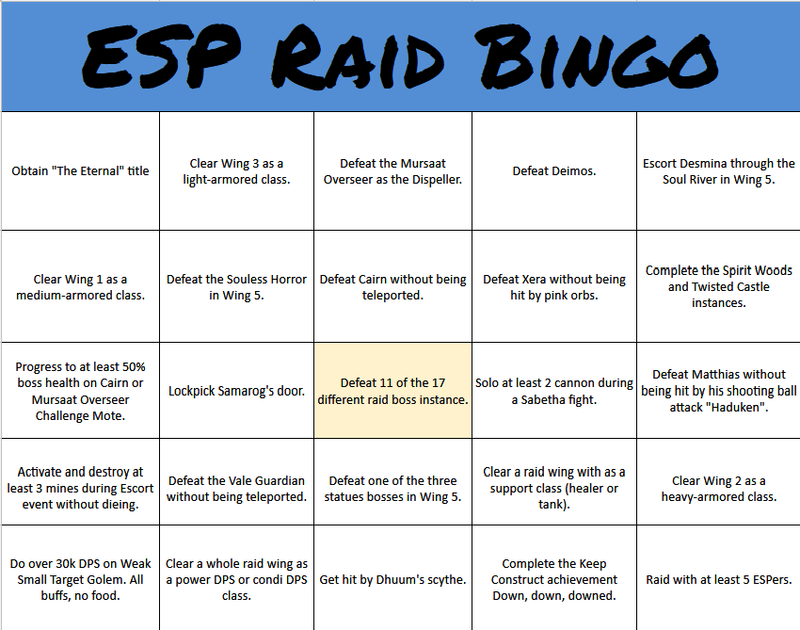 You can have up to six Bingo entries if you complete the entire card. Winner will be pulled at our Birthday Party. Prize TBD; there will be a prize for the first person to complete this, and a raffle for all completed bingos. You are responsible for keeping track of your own progress. 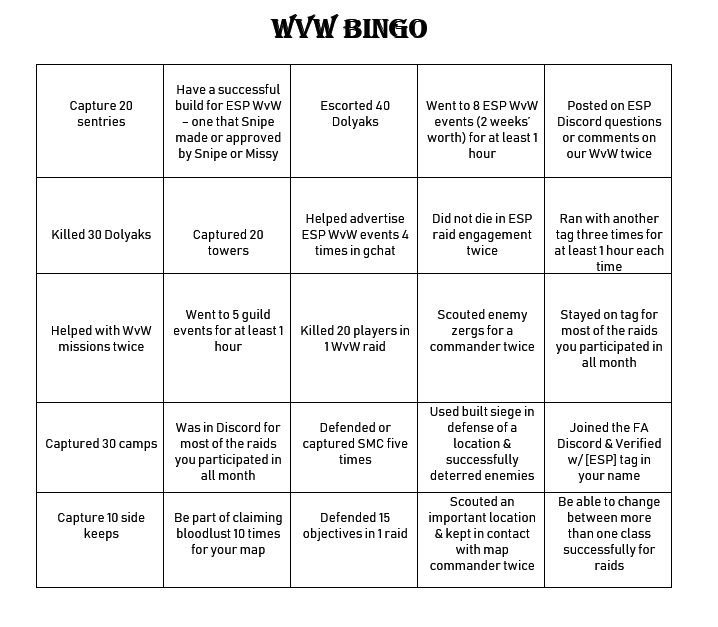 The leadership will be watching the roster, so if you come up with a Bingo in the first week and no one saw you in WvW, you need to do it again. 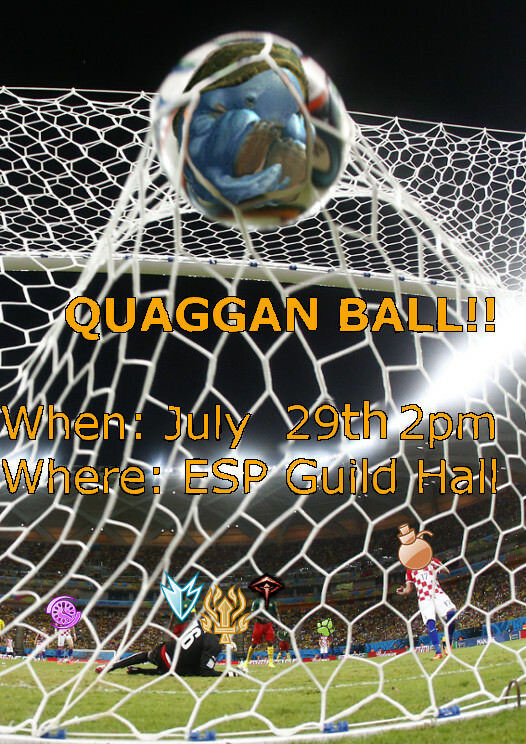 **The "Went to 5 guild events for at least 1 hour" and "Helped with WvW missions" is for ESP guild events/missions. **"Stayed on tag most of the raids" means all of the wvw raids you went, on ESP or on your own with another tag (unless you're a scout/sentry in which case the commander will know that). This includes staying with your group in havocing (5-10 people). Roaming of course is solo or with 1 to 3 other people and not needed to stay together. **"Was in Discord for most of the raids" is for all wvw raids you went on, ESP or on your own with another tag. **If you already completed and currently use a WvW build Snipe posted - or worked with someone else to make it - and it's successful in WvW, you can mark those as complete at the start of the month. **"Helped advertise ESP WvW events 4 times in gchat" should have been "4 different times". Spamming "wvw in 10 minutes" 4 times for 1 event does not count. It needs to be for 4 different guild events. During ESP guild events; we will be responding to the map as usual and not blatantly working on this card (except missions obviously). If we happen to do part of the card then awesome! Keep track.